Featuring a large, lash-maximizing brush that thickens each lash from base to tip - extreme length and volume is achieved. This color-rich formula creates high-impact definition, volume, and separation without any clumps, flakes, or smudges. 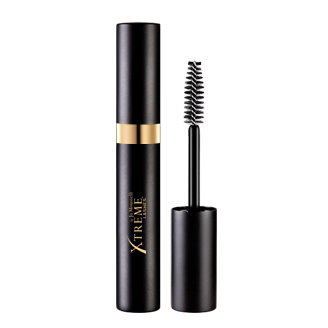 With lash conditioning ingredients and a formula that doesn't disrupt eyelash extensions, the Xtreme Lashes by Jo Mousselli Length & Volume is a must-have mascara that can do it all. Do NOT apply Length & Volume Mascara to eyelash extensions applied using the Volumation™ technique. It is not necessary or recommended. For use with classic eyelash extensions, apply from the middle of the extension and gently brush upwards to the tips. This technique prevents excess product from depositing at the lash attachment area. For use with natural lashes, start at the base of eyelashes and work through the tips. Apply two coats or more for added drama. To remove mascara, saturate two Lint-Free Applicators with Eye Makeup Remover & Facial Cleanser and place one applicator beneath and the other above the lashes. Gently wipe in an upward motion (working from base to tip) to loosen and remove mascara. Rinse applicators with water and repeat the process if necessary. Next, rinse eye area with water to remove all traces of mascara. Once eye area is clean, pat dry, and groom eyelash extensions as necessary using the Deluxe Retractable Lash Styling Wand.